Instant ramen noodles (or cup noodles) are dehydrated noodles that come with soup-flavored powders. They're inexpensive and easy to prepare—just add hot water and in about three minutes you have a meal. The problem, however, is these packaged noodles are high in fat and sodium and not all that nutritious. Take a look at the label and you'll see there are two servings per package. This means that half of the package of ramen noodles has 190 calories, 26 grams of carbohydrates, and over 7 grams total fat, including 3 grams of saturated fat. And the worst culprit? 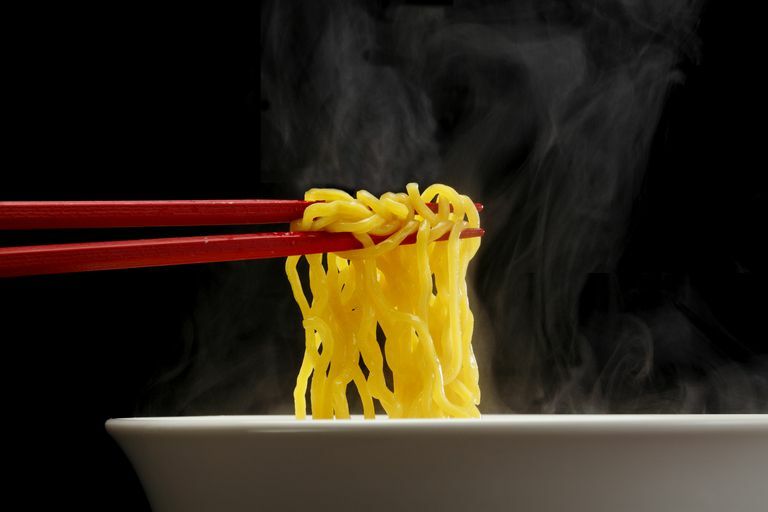 One serving of ramen noodles has about 500 milligrams of sodium. Unfortunately, there really aren't any health benefits of ramen noodles other than a good amount of iron, which is necessary for moving oxygen throughout the body and preventing fatigue and anemia (iron deficiency). However, because these instant noodles are high in sodium and fat (including saturated fat) and they are low in fiber—and very low in any real nutrients—the negatives outweigh the one positive. These instant ramen noodles also will not help with weight loss. They are low in fiber and protein—two important factors in losing weight—and are calorie-dense considering the package is small; even if you eat the whole package (2 servings), you're probably going to be hungry again in a short time. Plus, since they're high in sodium, eating ramen noodles can lead to bloating and water retention, which doesn't help when you're trying to lose weight. Although you don't want to depend on cup noodles as a staple food, you can improve their nutritional value by adding additional ingredients that are low in calories but high in nutrients. That way, you'll still have an inexpensive meal that isn't entirely bad for you, while you increase the volume and double the number of servings. The addition of chicken and vegetables adds vitamins and protein without adding much fat. Each serving still has close to 200 calories, but it only has 4.5 grams of fat and less than 2 grams of saturated fat. This makeover has also increased the fiber from 1 gram to about 2.5 grams and added lots of vitamin A, lutein, and B vitamins. Adding vegetables and lean meats not only adds volume to the ramen noodles and increases the number of servings, but it also helps to reduce the impact of the bad fats in the ramen noodles. Prepare your noodles by cooking one package of chicken flavor ramen noodles until soft in three cups of boiling water. Add the flavor packet. Add cooked chicken breast meat and frozen vegetables. Stir until vegetables are heated thoroughly. So far, so good, but you can improve the health value even more. Round out this meal with a nice small garden salad with olive oil or walnut oil and vinegar or a light salad dressing. Now you have added some healthy fats and even more vitamins, minerals, and fiber. Although chicken and frozen vegetables are a natural addition to ramen, you can be creative and try other proteins, vegetables, and flavorings. Add shrimp or cooked fish for healthy omega-3 essential fatty acids and enhance the flavor with sesame oil, mushrooms, bean sprouts, water chestnuts, and bamboo shoots. If you want to cut back the sodium even more, you can reduce the amount of powder from the flavoring pack. Supplement by adding flavor with garlic, pepper, or your favorite herbs. If you prefer the styrofoam cups of ramen noodles, remember that each cup is two servings. Prepare your cup of noodles with hot water and pour the noodles overcooked vegetables and meat. As with the ramen noodle makeover, you have now doubled the servings to four. Are Fish Eggs a Healthy Addition to Your Diet? Should You Start Drinking Pickle Juice for Your Health? Are Energy Drinks Healthy or Unhealthy for You?